"Java everyday" was a joke about Java vulnerabilities, where almost every day a new Java zero-day was seen. 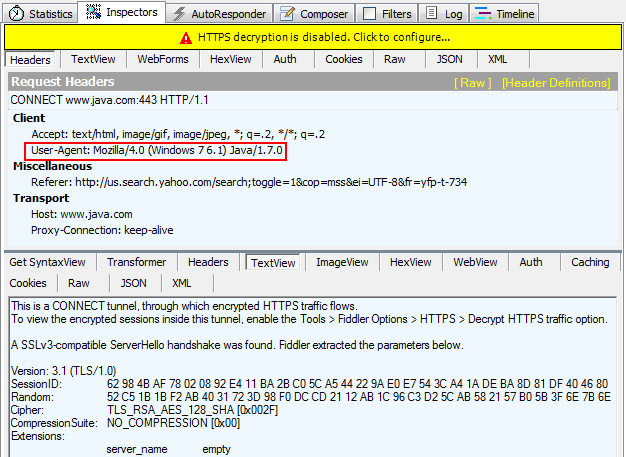 Recently, the "Java 0-day spotted in the wild" is no longer in the headlines every week (see http://java-0day.com), but Java exploits are still the biggest concern regarding exploit kits and drive-by-download malware. In a recent Kaspersky report, they found that about 90% of the exploit kits were trying to infect the victim machine via Java. Okay, so we have a problem called Java in the browser, let's look for a solution! Remove Java from your browser. Both solutions are non-solutions for enterprises. Still, a hell a lot of in-house-built applications need old Java - e.g. 1.6.x, which is end-of-life since February 2013. Next recommended "solution" is: "Create separate browsers for Internet and intranet usage. The intranet facing browser supports Java, the Internet facing does not." Although this sounds pretty effective, there are still a lot of problems with this approach. Now IT has to update two browsers instead of one. Users has to be trained, and in a web-security gateway (web proxy) one has to configure that this browser can go there but the other can't, etc. And still there might be Java applet based applications outside of the organization which has to be used by a bunch of people. LOL. Teach NoScript to 50000 users, and see how they will learn the "Allow all this page" first, and "Allow scripts globally" the next time. I think this is a good countermeasure, but from now on the exploit maker either needs an exploit to bypass the click-t-play, or to socially engineer the user to click so this is not a bulletproof solution either. Okay, so far we have five totally useless recommendations. The next one seems pretty good at the first sight: "White-list websites which need Java, and only allow Java to these sites." Let's dig deeper. How can we "white-list" sites? This is not supported from Java out-of-the-box. In a decent web-security gateway one can create white-lists, but we have to define a condition for Java traffic. A common misconception is to say: let's identify Java traffic for .class, .jar, and .jnlp file extensions, and only allow Java for white-listed websites. Although this will block some exploits, but not all. Two things can be flagged here as Java: the User-agent and the Mime-type in the request. I recommend checking for both. The User-agent can be checked via regular expressions, and if one matches, flag it as Java request. No executable extension (e.g. .exe, .dll), the response Mime-type is faked to audio/mpeg, and even the malware is XOR encrypted with a 4 character key (I let the exercise to the reader to guess the XOR key). Even if the web-security gateway looks for file headers to identify executables, it won't find it. 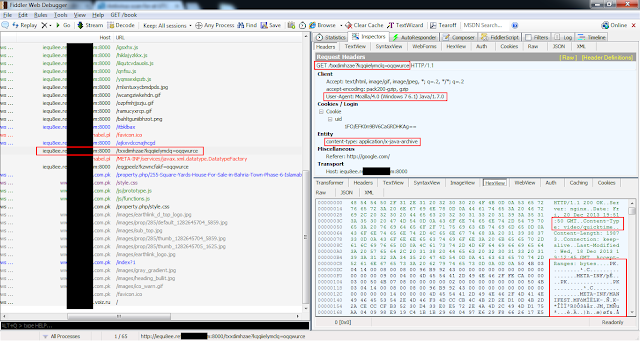 The malware is decrypted only on the victim, where the AV might or might not find it. Although the User-agent here is Java again, be aware of the fact that at this stage, the User-agent can be faked by the exploit. 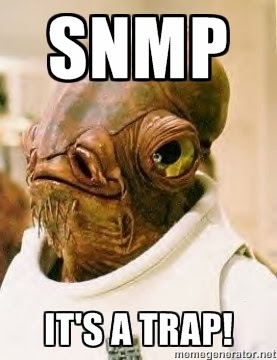 Update 2013.01.02: I forgot to mention the case of SSL interception. Although in an enterprise environment it is a good idea to intercept SSL traffic (except on finance, webmail, healthcare, etc. sites) in order to hunt for malware (and block Java), but if you don't do this, it is not a problem. There is again a misconception that the User-agent of the client browser is not visible in an SSL connection on the proxy (web security gateway). Below is a screenshot to disprove this statement. In case of a transparent proxy, yes, there might be no user-agent. If we white-list sites on the web-security gateway, and block any other traffic when we see Java based User-agent or content-type, we are good. Well, almost. As long as the client is in the enterprise… What you can do here is to enforce the mobile devices the use of VPN every time it is outside of the corporate network, and only connect it to the Internet through the corporate web-security gateway. I know, this is still not a solution, but I can't think anything better at the moment. Leave a comment if you have a solution for this. Now the only Java threat is that someone hacks one of the white-listed websites in a watering hole attack, and serves the java exploit from the same page. Not a likely attack, but possible for a real advanced threat. You can flag Java traffic via User-agent regular expression, or content-type (in the request), or both. Special care needs to be taken on mobile devices, which leave the enterprise on a regular basis. Of course, you will need other protections too, because this is not a 100% solution. And if you are a plain home user, you can safely delete Java from your browser, or use a decent Internet Security Suite which can effectively block Java exploits. We all know since at least 1990, that the DNS protocol is insecure. Yet DNS is still the basis of almost all Internet communication. The biggest problem with DNS is that a malicious attacker can redirect victims, where victims try to connect to e.g. safesite.com, but instead of this they connect to the attackers website. There are a lot of different ways to achieve this attack. The attacker forces the victim's DNS server to resolve a domain where attacker is the authoritative name server, and the attacker sends additional information to the DNS server that he is also the authoritative name server for safesite.com. This information is cached and used later when victim resolves safesite.com. It is easy to protect against this attack, any decent DNS server should be able to protect against this attack by dropping these additional information from DNS responses. the random(?) 16-bit(!) unique transaction number in the answer matches with the query. To protect yourself against this, you should randomise the source port and unique identifier better, and disable your DNS server as being an open recursive resolver. This is pretty common in both banking trojans, adwares, etc. The malware reconfigures the users configured DNS server to use a malicious one, either in the local OS settings or in the home router. Sometimes the ISP hijacks your connection because the government want to spy on your communication, or hijack it. Use TOR wisely if you don't want to be a victim. Sometimes captive portals use DNS hijacking to redirect the users to the default login page. Although it breaks things, it is still better than the ISP solution, because it is only a problem at the beginning of the connection, and not permanently. Although this is not malicious at all (developers might think otherwise), but a lot of application security tests (thick clients, mobile applications) can only be carried out via DNS spoofing. Application security testers can easily do this attack, because they can place the host machine in a network segment where they can do an active man-in-the-middle attack, and respond to DNS queries sooner as the official DNS server. Or simply set the DNS server to their own DNS server. This is similar to the previous one, but the goal is different. Although an attacker with active man-in-the-middle position can attack the victim in 1000 different ways (like SMB relaying, capturing LM/NTLM network hashes, modifying clear-text traffics, etc...), DNS spoofing is one of them. I believe this is going to be a new trend. This attack is the most effective one, and the hardest to prevent. Usually it is not the admin panel what is being hacked, rather an admin's password gets stolen, or the password reset is hacked. Although almost all attacks can be mitigated one way or another, there was a desperate need to solve this DNS spoofing issue once and for all. And so it begins, DNSSEC has been developed. In part 2 we are going to investigate DNSSEC, what you can expect from it, and what you can't. Hey! I just wanted to make a quick blog post, letting everyone know that the blog is not dead, but I was very busy lately. After making the USB flash drive HW Trojan, I decided to move forward, and replicate Netragard’s Hacker Interface Device . It was easier than I first thought and since I didn't find a detailed article on how to make one (the best ones   were in French, but I think the vast majority of people prefer English), I decided to create this blog post, so everyone can easily make it for a nice prank or for a cool social engineering attack during a penetration test. Again, I am going to assume that you have at least some basic experience with soldering. If you don't have, take a look at Limor Fried's (a.k.a. ladyada) page about the basics of soldering or Sparkfun's Soldering Basics (takes about 40-30 minutes practicing to learn how to solder through hole components). desolder the USB host connector ports from the HUB and solder the PC mouse to one USB port and also solder a USB MINI-B connector to another USB port so you could connect the Teensy to the USB HUB. 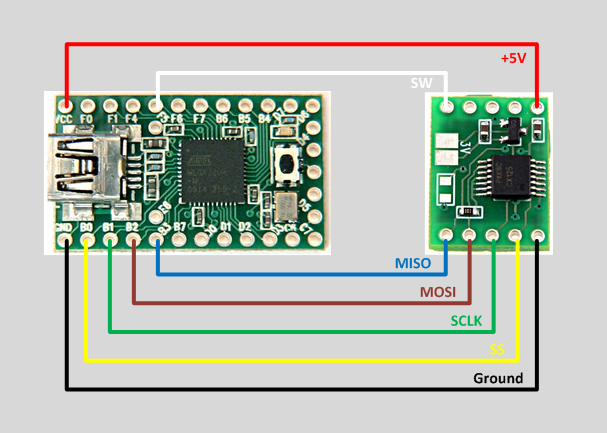 I cannot give more details on how to disassemble and desolder the USB HUB, since it is specific to the model you will use. For the HUB UFO 4 I used, the PC mouse USB cable was soldered to the upper rigth corner of the picture, and on the left and rigth side, you can see the PC Mouse and the USB MINI-B connector soldered to the removed USB host connector ports (on the bottom, you can see the holes of the USB connector I removed from the HUB). This step is optional, but I strongly recommend doing it since by soldering a wire to the left mouse button's micro switch, you will be able to detect if someone is using the computer by checking if the mouse button was pushed or not. A micro switch can have different number of leads, but in a PC mouse they usually have 2 or 3 legs. Again, this is something you need to figure out on your own, because it depends on the PC mouse you use, but I have made a few pictures to give you an example. Once you have everything soldered together, all you have to do is connect the Teensy to the USB MINI-B cable and stuff everything into the PC mouse :) This last momentum can be tricky and you might want to use some (insulation) tape to keep things from moving away while you close the mouse. And again, that's all! :) As I promised in my previous post, I will make a detailed blog post on how can you program such a device and what evil payloads you can use. Check out the pictures I have made from the final product as well as the additional resources on malicious HIDs and Trojan PC mice! Create your own malicious keyboard or mouse! These are more just notes for myself, but maybe someone else will find it useful. So I got a Samsung Galaxy S2 I9100 to play with and it had Android 4.0.4 (Ice Cream Sandwich) on it which was pretty easy to root with CF-ROOT, but I wanted to use to latest official Android firmware for this phone, which is by the time of this post is Android 4.1.2 (Jelly Bean). Auto update was not an option, since I had CF-ROOT on it, so I had to find a stock firmware and use Odin for the update. Getting a stock firmware was the easy part. You can get it for example here: http://samsung-updates.com/. So in my case, I needed one from here: http://samsung-updates.com/device/?id=GT-I9100 and for me it was a I9100XWLSW. Next, rooting the 4.1.2. Again, lots of howtos can be found on this too, but most of them suggest you to use Odin3_v3.07. Well, when I tried it, SuperSU was not correctly installed, and the whole system got a little slow, so I tried with Odin3_v1.85 and it worked like a charm. So basically you can follow this howto: http://www.teamandroid.com/2013/07/28/root-xwlsw-android-412-galaxy-s2-i9100-stock-firmware/ but instead of Siyah-s2-v6.0b4.tar I would recommend using the SiyahKernel S2-v6.0beta5 which you can find here: http://d-h.st/frK. And that's all! Happy hacking! Not sure which exploit is the one, because we tried it the hard way: the mysql root user had the password "password" and we tried writing files with it. Other artifacts were like: user password hashes, sensitive information in text files, ssh keys, missing patches, etc. I needed these recently, and I thought it might be useful for someone else too. So thanks for reading, thx for commenting and stay tuned for more security posts coming up soon! About six months ago I had an engagement where my task was to exfiltrate data from a workstation on some sort of storage media. Given that I already knew about such techniques for Arduino  and Teensy , I thought it would be a great opportunity to try them out in real life too. As a first step I had to bypass a host port protection solution, which was not easy, but I managed to find a way to defeat it. After that, I was good to go to use a Teensy to deploy the exiltrator binary from . Error: Error Parsing '<base64_stuff_here>' as bin.base64 datatype. Of course, normally you need just one of these methods, but as you can see, sometimes only one of them will work, and it's handy to know each of them. Just execute it, and you will have your payload.exe next to the script. 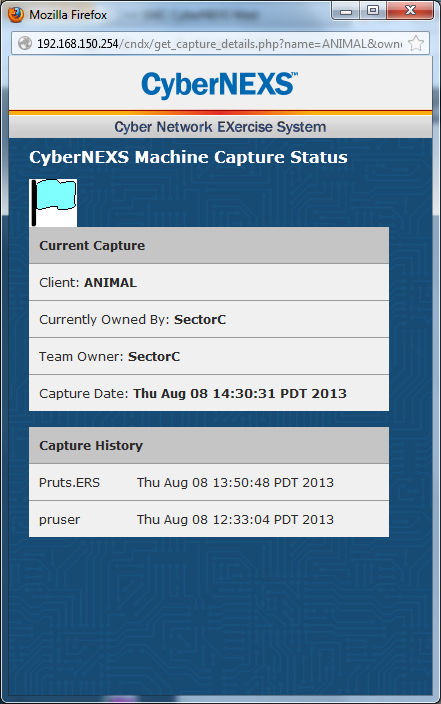 Last but not least, you can use csc.exe that is shipped along with .NET Framework. The following C# needs a text file with the base64 encoded payload in it, but you can modify it to have it in a variable. I got this from a colleague and I was lazy to change it, so I just put the base64 payload into a comment and copied it manually into a file. You can also make the variable names shorter, so it takes less time for the Teensy to type in, but I think the most time consuming is to type in the base64 payload. And that's all! :) Three easy ways to deploy a binary on a Windows box! I quick update, since I forgot to write about the HW I used. It's plain simple actually, just a Teensy 2.0 with a Teensy SD Adaptor, connected to the PC with an USB A type to USB MINI-B type cable. 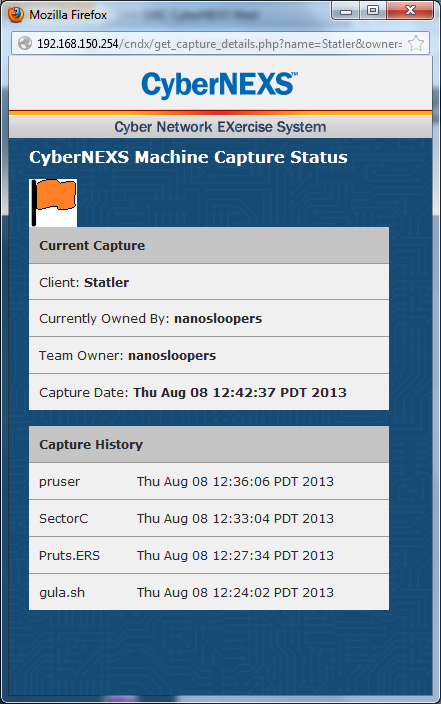 Cyberlympics Round 2 is now over :). I think it was a bit less fun than last year, but it was also better this way cause it was more realistic. I was willing to make a nice write-up this time as well, but since we only saw our current points and made fixes in parallel, sometimes it was not possible to figure out what gave us points and what didn't. We had one Windows 2003 and a Fedora 16 box and we had to harden those after signing in with the CyberNEXS client. Srsly, why do we need these challenges? A harder forensics challenge would have been much better... maybe next year. BTW, if you want to practice forensics challenges of pcap files, check out the Honeynet Project Challenges! Basically we used 3 tools: NetworkMiner free edition, xplico and JPK for the challenges. QUESTION 1. What files were transferred to/from the victim? QUESTION 2. What malware/unauthorized programs were installed? QUESTION 3. What directory were files transferred to or from? QUESTION 5. What is the router password? QUESTION 6. What was the admin doing during attack? QUESTION 7. What were user passwords changed to? QUESTION 8. Were there any suspicious users on the machine? And user "badmin" was the answer. QUESTION 9. What file did the attacker hide info in that he later extracted? QUESTION 10. What do the secret messages decode to? No clue, if you got this, pls comment or send it to me! Thx! So we were not able to solve this, but big thanks to santrancisco (see comments), I know now that the solution was Railfence cypher with Rails = 8. Team gula.sh is participating in the Global Cyberlympics 2013 games, and we have been doing a little practicing before the first round. Although we missed the practice rounds (I didn't get any e-mails, some of my teammates did...), thanks to my friend Hari from the Indian *. * null team, we obtained the practice round challenge package and played with it a little. Solution: WELCOME TO THE JUNGLE, WE HAVE FUN AND GAMES, SOME OF THEM ARE EVEN STAEJRWU. Solution: THIS OLD MAN, HE HAD FUN, HE PLAYED BOUTDTMS ON MY THUMB. Digraph (a pair of characters used to write one). Solution: sometimes the older ways are the better ways, this eimwetot is not one of them. It was a text in hex. Solution: I ONCE TRIED TO COUNT IN HEXADECIMAL BUT I KEPT LOOSING COUNT AFTER XUNEFILM. It was a text in binary. Solution: IF YOU ADD UP ALL THE ONES IN THIS MESSAGE IT SPELLS SNFNLEGI IN EBCDIC. Solution: TOO MANY TIMES I LOOK INTO THE FACE OF OBEMTGOE AND REALIZE THAT I AM STARING BACK AT MYSELF. Solution: IF YOU KEEP DECRYPTING ME LIKE THAT I THINK I AM GOING TO YGTRIPLO ALL OVER THE PLACE! Solution: THERE ONCE WAS A MAN FROM NANTUCKET. WHOSE NAFCMHUE WAS SO LONG, HE COULD… KEEP YOUR MIND CLEAN!!!! Solution: IF YOU KNEW JULIUS LIKE I KNEW NADNEJUE THEN WE WOULD NOT NEED A CASEAR CIPER AT ALL. Solution: there is something evil in the way a random substitution works, it makes kewmtyat look normal. Couldn't find the solution for this one in 10 mins, so we skipped it. Anyone having the solution for this, please comment, or send it to me. Thx! It was a JPEG file of a QR code. 2 JPEG files, one was a cute bunny, the other one was a QR code again. I was too lazy to solve this one. It's a zip file, with a JPEG file named FILECARVE_ME03.JPG within. Again, if you have the solution, please comment, or send it to me. Thx! I was too lazy to solve this one too. It's an mp3 file, and I think it's morse code. Once again, if you have the solution, please comment, or send it to me. Thx! Back in the Backtrack days, I really liked to create an encrypted, persistent, USB thumb drive of my favorite penetration testing distribution. It comes really handy during an engagement, where you can boot from a USB drive, but since you will still work in your client's environment you want to store your findings securely, on an encrypted drive. With Backtrack, I was basically always following the most recent howto of Kevin Riggins . Fixing this is not difficult, but it's quite annoying, so I decided to write this howto for those who would like to find the whole solution in one place, until a fixed ISO is released by the Offensive Security guys. The installation steps are basically the same as described in the official documentation , so just follow these steps. You can use a virtual machine (using VirtualBox for example), load the Kali ISO into the virtual CD/DVD, and adding a USB filter on your USB drive (you can find the details explained by Jeremy Druin in ). Personally, I used a Live CD, plugged in a USB drive and did the installation on a laptop. Erasing a 32 GB thumb drive takes a few hours, but even a 8 GB drive would require some time. Either get prepared for it (I chose to wait and erase it while I was asleep), or skip it. When you are asked to install GRUB to MBR or first hard disk, choose "No" (or "Cancel", I don't remember the name of the button, but just say decline it). After this, you will be asked to define where to install GRUB. Choose you USB drive. For me, it was /dev/sdb. No worries, we will fix this quickly, based on what I found on the Kali forums . However, we are not done yet, since if you reboot, you would have to enter the above again. To make these changes persistent, we need to edit the /etc/crypttab file. 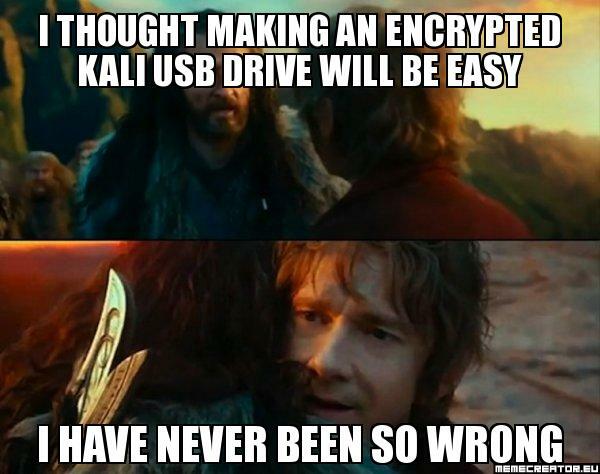 If you have done everything right, you shouldn't get any error messages and once you reboot, the encrypted drive will be automatically mounted and Kali will boot up from you USB thumb drive. I just love www.commandlinefu.com :) Found a real treasure on it today. This post is just a quick note for me how to get only the shellcode from objdump using a one-liner. So recently I was playing with iOS and Android devices, and saw a video on Hak5 by Darren Kitchen about Brute-forcing Android PIN Lock with Rubber Ducky (see  and ). Now, I don't have a Rubber Ducky, only Teensy 2.0 and 3.0 boards and I prefer them anyway, since they are giving me more flexibility (plus, the Teensy 3.0 is pretty powerful too). Also, they are a lot more cheaper :). I looked for an Arduino code for Teensy, but I only found a similar project for DigiStump's DigiSpark Model A , so I decided to write a small, quick and dirty program for Teensy. I bought a USB-OTG cable and stared playing with it. Luckily (or unluckily? ), on Android, the only penalty for wrong PINs is 30 seconds after 5 tries. A quick calculation, and you can see that a 4 digit PIN takes a little less than 17 hours to brute-force. The code was written in the Arduino IDE. I know that the PIN brute-force part can be written using only the loop() without the for loops, like in , but I think it is easier to understand the code like this, and I don't think it has any real difference in terms of performance for this case. Since brute-forcing even a 4 digit PIN takes a little less than 17 hours, you probably will not be able to do it in one run because the battery will die before that, so I decided to define the digitX_start and digitX_stop global variables to make the setting of the start and end values for the PINs to try more comfortable. This way you can divide the 10000 total combination into five 2000 PIN chunks for example, and between them, you could charge the battery of the target phone. During the PIN brute-forcing part, the On-Board LED is turned on while we wait 30 seconds between 5 tries in order to indicate that the Teensy it is currently waiting (I shamelessly stole this idea from the code found on ). After all the PINs were tried once, I keep on hitting enter every 2,5 seconds to avoid the automatic screen lock, and start blinking the On-Board LED to signal that the PIN brute-forcing part has finished. Attach the USB-OTG cable to the Phone. Attach a USB A to USB MINI-A cable (Teensy 3.0) or USB A to USB MINI-B cable (Teensy++ 2.0 or Teensy 2.0) to the USB-OTG cable. Attach Teensy to the cable. Bring in the screen lock screen on the Android Phone. You will have 5 seconds by default to do this, but you can change it in the setup(). I also bought an Apple iPad Camera Connection Kit, that allows you to use a USB keyboard with your iPad and I wanted to use my Teensy to perform an online Brute-forcing against the Simple Passcode Lock, which is the default if you set the Passcode Lock. Passcode validation is performed at two levels in iOS: one at springboard and another one at kernel level. Brute-force attack performed at springboard level locks the device, introduces delays and may lead to data wipe-out. After the first 6 tries: 1 minute. After the 7th try: 5 minutes. After the 8th try: 15 minutes. Since a Teensy would simulate a person tapping in a Passcode (meaning that we are on springboard level), I don't think this is a feasible attack. The whole thing is well explained on Pierre Dandumont's blog , except he didn't published any PoC code. I decided to test it out and publish it, since it only works on the Settings screen and it might be patched by Apple later. It takes about 1,5 hour to check every possible combination (I keep a 0,5 sec pause between each try). Attach the Apple iPad Camera Connection Kit to the iPad. Bring in the Settings screen on the iPad, and choose the "Passcode Lock" menupoint. You will have 5 seconds by default to do this, but you can change it in the setup().